Floyd Mayweather unveils quite the piece of artwork here following on from the final fight of his boxing career against Ireland’s McGregor. Before their well publicised bout a month ago in Las Vegas, Conor McGregor showed a giant painting of him connecting with a punch on the face of Mayweather in his gym in Dublin, Ireland. 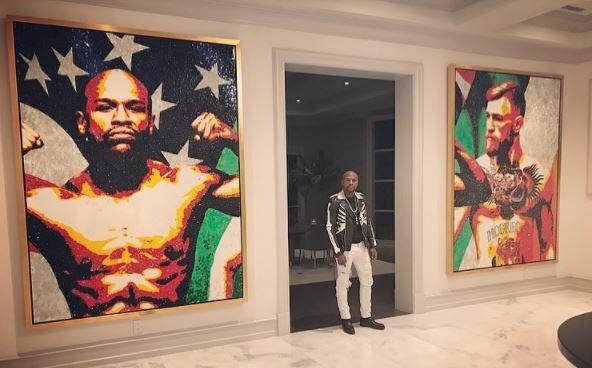 It made big headlines at the time but now, Mayweather has come up with his own painting. Perhaps more flattering to Irishman McGregor with no such punch connecting on his face in his particular piece of art work. Mayweather has been spending a lot of time in his above new mansion in Beverly Hills since the bout and is understood to be categorically now retired from the sport of boxing as an active fighter. Whether McGregor returns for another run at boxing remains to be seen. Strong speculation suggests this is not in his immediate plans however. A return to his usual combat sports realm of the UFC is thought to be more likely by the end of 2017. Most likely against Nate Diaz.